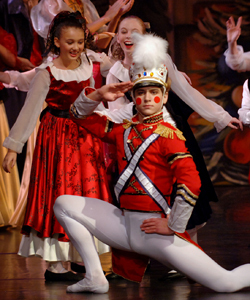 Following sold out performances in 2008, Maple Youth Ballet will be performing in a spacious and New Venue, Portola High School Performing Arts Center to perform their enchanting and unparalleled production of The Nutcracker. 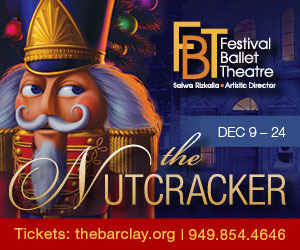 This holiday crown jewel by award winning choreographer, Charles Maple, features exquisite dancing, opulent sets and costumes and dazzling special effects. Eye popping production values include a life-size gingerbread house, Swarovski crystal curtain, an eight-foot teapot and a spectacular Christmas tree that grows to 55' and encompasses the entire stage. Traveling all the way from the Royal New Zealand Ballet to perform in the role of the Nutcracker Prince is professional dancer Yuri Marques. Mr. Marques will dazzle the audience with his athleticism and pristine technique.